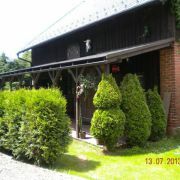 Separate house at the fencing lot near the place called „Hrádeček“. Max. 9 places, 2 separate bedrooms, common … More » room, kitchen, terrace, outdoor hearthstone, swimming pool, sportground. Dogs are allowed. Possibility of trips: Pec p. Sněžkou, Janské Lázně, Špindlerův Mlýn, Adršpach. 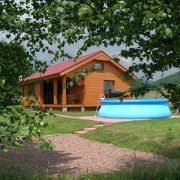 New wooden cottage at the foothills of Giant mountains, in a village Vlcice situated close to „Hradecek“ at Trutnov … More » county. Ideal for families with children or group of friends. 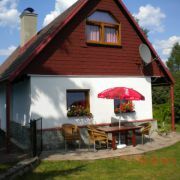 The house an the foothill of Giant mountains near the place called „Hrádeček“, 8km from town Trutnov, 9km from … More » Janské Lázně, 18km from Pec p. Sněžkou, 3km from new golf course and ski resort (Mladé Buky). Parking at enclosure area. 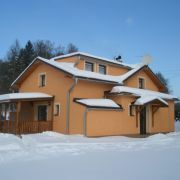 The house has been newly renovated in the year 2009 and it is located directly by the railway station Vlcice. The … More » house offers accommodation for up to 10 people. Close distance to the ski areas in the Giant Mountains. The house is furnished for comfortable living. We rent the whole house.